What is Kittywalk Portable Outdoor Cat Tunnel? The Kittywalk Portable Outdoor Cat Tunnel is an outdoor cat tunnel with a durable, industrial strength fishnet for cats to play, lay around in, or just bird watch. It's great for indoor cats that want to get outdoors to play, but need to be contained so they don't run around the neighborhood risking injury. The tunnel is completely enclosed with 2 doors on either end with steel wickets and rip stop netting. It is ideal for a backyard patio, deck or apartment balcony. In addition, the Kittywalk Portable Outdoor Cat Tunnel can be added on to most pet doors so your cat can go in and out whenever he or she feels like. Once unfolded the tunnel is 6 ft. long and can also be attached to the Kittywalk Outdoor Cat Tunnel or the Kittywalk Outdoor Cat Enclosure. How does Kittywalk Portable Outdoor Cat Tunnel work? The Kittywalk Portable Outdoor Cat Tunnel can be set up in a matter of minutes on your deck, patio or apartment balcony to create a safe place for your cat to get fresh air without your worrying about escape or injury. The tunnel itself is 6 ft. long and comes with 2 doors. 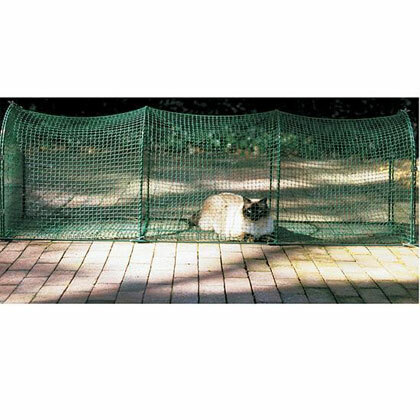 The Kittywalk Portable Outdoor Cat Tunnel gives your cat the maximum amount of visibility and ventilation and is made out of rip stop netting; just in case he or she finds it necessary to climb. Unsnap a section of the Kittywalk Portable Outdoor Cat Tunnel and attach to a pet door to allow your cat the ability to go in and out when he or she so chooses. It's made out of steel wickets that is weather resistant, so it can be used during all seasons. However, when not in use, you can simply fold up the Kittywalk Portable Outdoor Cat Tunnel, place inside the included storage bag and tuck away in a dry spot for a later play date. The Kittywalk Portable Outdoor Cat Tunnel can be combined with the Kittywalk Outdoor Cat Tunnel for a little extra length or the Kittywalk Outdoor Cat Enclosure for a full day of playground fun! Don't leave your cat unattended for long periods of time. Once you receive the Kittywalk Portable Outdoor Cat Tunnel, unfold and place anywhere on your deck, patio or apartment balcony. Once set up, allow your cat to go inside the Kittywalk Portable Outdoor Cat Tunnel. Also can be hooked up to pet doors so your pet can go outdoors at will. The Kittywalk Portable Outdoor Cat Tunnel can also be connected to other Kittywalk units. Stretches up to 6 ft.